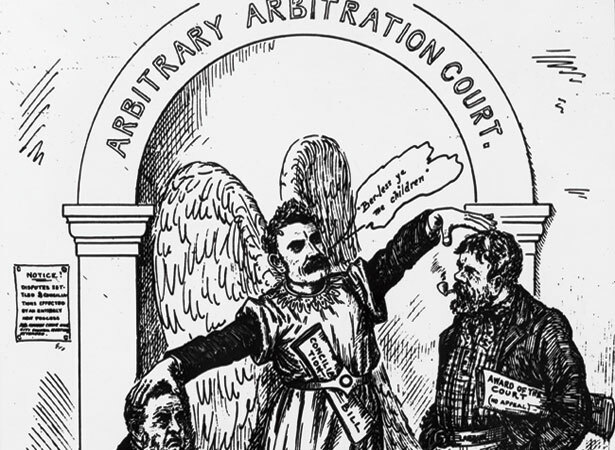 The Industrial Conciliation and Arbitration (IC&A) Act made New Zealand the first country in the world to outlaw strikes and introduce compulsory arbitration. Following the failure of the trans-Tasman Maritime Strike of 1890, some major employers refused to recognise unions, blacklisted their members and slashed wages and conditions. The Liberal government that took office in 1891 was determined to find an alternative to industrial conflict, and to foster the union movement, which it saw as a key political ally. The brainchild of Minister of Labour William Pember Reeves, the IC&A Act recognised trade unions and individual employers or industrial unions of employers as responsible parties in the negotiation of wages and other employment conditions. Each party would be required, if in dispute with the other, to discuss the matter at district Boards of Conciliation. If this failed to produce an agreement, the dispute would be submitted to a national Court of Arbitration. The arbitration system would remain the cornerstone of New Zealand’s industrial relations system until 1973, when a new Industrial Relations Act superseded the IC&A Act. We have 4 biographies, 3 articles, related to Arbitration Act becomes law.